Three-way speakers tend to reside at the higher-priced end of the market — can Prodipe succeed with a budget-friendly option? Many of the active monitors I’ve written about within these pages have come with both decidedly eye-watering and wallet-emptying prices. The subject of this review however could hardly be more different. 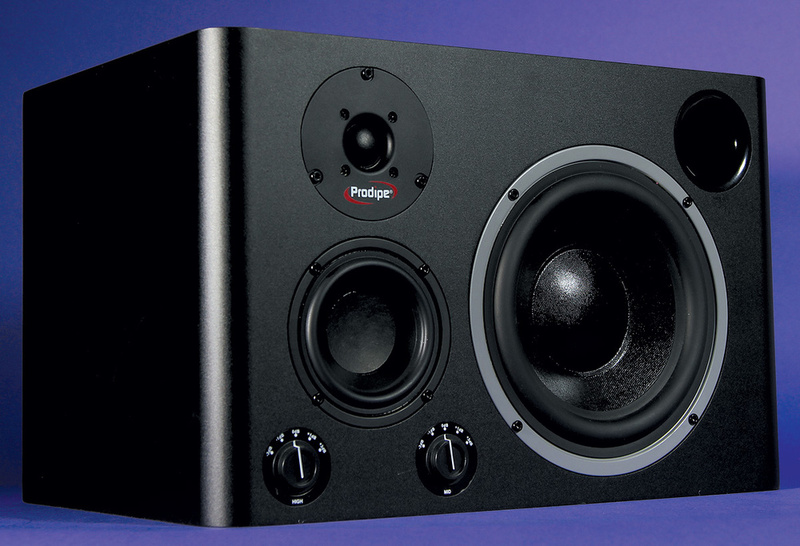 In fact, despite being designed to do pretty much the same job as those speakers, the Prodipe Pro 8-3W would set you back as little as 10 percent of the price of some of them. So, does it cut the proverbial mustard and get close to the performance of its far more expensive predecessors? There is of course an almost unlimited variety of active nearfield monitors that can be had for the same sort of outlay as the Pro 8-3W, and the review pages of Sound On Sound are populated by a regular supply of them. The arrival of another competitively priced two-way, active nearfield monitor can be guaranteed almost as surely as the rising of the moon, an England batting collapse and disappointment at the World Cup. So, what’s different about the Pro 8-3W? Well, it’s a three-way design for a start and, it has to be said, it looks an awful lot of speaker for the money. There’s an argument to be made that the prevalence of two-way speakers — those with just a bass/mid driver and a tweeter — generally represents a triumph of pragmatism over electro-acoustic engineering. You see, any bass/mid driver big enough to provide acceptable low-frequency bandwidth and power struggles to reach far enough up the audio bandwidth to meet a typical tweeter. And similarly, tweeter diaphragms small and light enough to provide high-frequency response that extends past 20kHz, and without serious dispersion issues, are typically operating close to their mechanical limits down where they meet the bass/mid driver. It’s like opposing politicians reaching for a reluctant handshake — it’s often not entirely convincing. Employing a mid-range driver seems like it’d be a no-brainer then. But, and it’s a big ‘but’, things aren’t that simple. Leaving aside the cost of a third driver, and the rather obvious point that, with a compact speaker, there’s often no space on the front for it, adding more filter stages in the electronics, adding a third amplifier channel, managing driver integration issues and incorporating a separate sealed internal enclosure in the cabinet, all conspire to drive designs towards the two-way solution. Three-way is often just too expensive and complicated; there’s too much to go pear-shaped, especially if you’re doing it on a tight budget. The rear panel is a sparse affair, featuring only the power and audio inputs, and an input gain trim.All of which brings me back to the Pro 8-3W. Being a three-way design, the Pro 8-3W is necessarily larger than the typical compact nearfield — no surprise there, its designers had to find somewhere to put the mid-range driver. It is in fact quite a big speaker, and if you find yourself tempted to try a pair, first make sure they will fit your studio space. In cost-effective speaker-design terms, a larger cabinet actually falls into double-edged sword territory: while generous internal volume means extended low-frequency bandwidth is easier to achieve, it also brings larger cabinet panels that can vibrate along with the music and significantly colour the sound. Internal bracing that might ameliorate the resonance of large wooden panels is often simply unaffordable if you’re targeting the budget end of the market. The Pro 8-3W front panel carries a 200mm bass driver, a 100mm mid-range driver and a 25mm tweeter arranged with the mid-range driver and tweeter vertically arrayed alongside the bass driver. The side edges of the front panel are softened, which will help a little with high-frequency diffraction. The Pro 8-3W is supplied in mirror-image pairs, and Prodipe recommend that they are used with their vertical mid-range/tweeter arrays outermost. None of the drivers obviously incorporate any esoteric technology or materials; at the same time, however, they all look to be competently designed units. There is something old-school about them though — the tweeter has a coated textile dome buried down a short, horn-shaped throat, and both the bass and mid-range drivers have pressed steel chassis. The bass driver diaphragm is a very traditional-looking coated ‘paper’ cone and dust-cap, and the mid-range diaphragm a similarly traditional thermoplastic cone. Of course, in describing a speaker as ‘old-school’, I’m not necessarily being critical. For example, at a Munich high-end hi-fi exhibition a few years ago, among all the massively sophisticated and high-tech speakers featuring ceramic and even diamond-diaphragm drivers, the best sound to my ears came from a pair of ATC speakers incorporating exclusively old-school diaphragm materials. Some lessons taught in the old school were undoubtedly good ones. 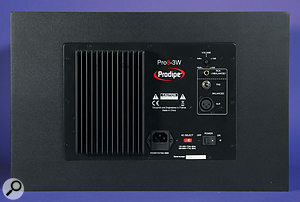 Around the back of the Pro 8-3W is the usual amplifier heatsink and connection panel. 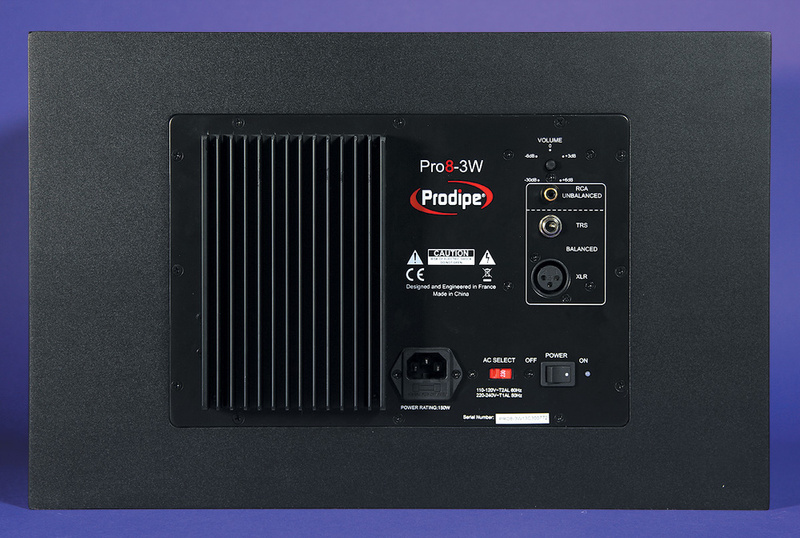 Perhaps not unexpectedly at the price, the Pro 8-3W offers just the bare minimum of rear-panel facilities — mains socket, mains switch, power indicator, balanced and unbalanced analogue inputs and a gain control. There’s no digital inputs or DSP malarkey, the lack of which part of me celebrates. The gain control offers ±6dB of adjustment but lacks detents, so there’s no way to be sure that both speakers of a pair are at the same gain unless you wind the control fully up or down. The Pro 8-3W amplifiers are specified at 90W, 40W and 20W for the bass, mid-range and tweeter sections respectively. (If you’ve ever wondered about amplifier power ratings for different sections of active speakers, the differences simply reflect the relative inherent electro-acoustic efficiencies of the drivers.) Back around the front of the Pro 8-3W, a couple of detented knobs (with legends and detents that don’t quite line up) provide some fine HF and mid-range level adjustment. A quick look inside one of the Pro 8-3Ws, achieved by removing one of the bass drivers, revealed what appears to me to be some evidence of cost savings. First, all the drivers are secured by wood screws rather than bolts and T-nuts. Wood screws are not inherently bad, in particular, to secure the relatively small and light mid-range driver and tweeter, however the bass driver is big and heavy and, when secured with just four screws that can’t be tightened particularly well thanks to the risk of the thread stripping, it can never be really intimately attached to the cabinet. Second, the Pro 8-3W cabinet is constructed from 15mm MDF rather than the more usual 18mm board, and despite the cabinet’s relatively large panel dimensions, there are no internal bracing ribs. A sharp knuckle wrap on the cabinet reveals it to be pretty resonant. Third, the cabinets contain just the bare minimum of internal polyester wadding for damping. And lastly, while there’s a flared plastic flange on the outer end of the reflex port that will help delay the onset of port distortion and compression, the inner end of the cardboard tube is just cut straight. The tube is also very long and of relatively small diameter. This is good in one respect as it means the port is tuned to a relatively low frequency, so is less likely to mess audibly with the speaker’s time domain performance, but it’s unfortunate in another respect in that longer, smaller port tubes become non-linear and turbulent earlier than shorter, bigger ones. One of the endlessly fascinating aspects of speaker design (no, really!) is the challenge of balancing all the conflicting engineering constraints and design requirements and hitting the cost target, and I think Prodipe should be applauded for even attempting a three-way active nearfield at such a competitive price. There’s one, presumably cost-saving, measure on the Pro 8-3W however that I think falls into the ‘cost-saving too far’ category. It’s also a measure that I’d imagine saves so little that it would probably be almost impossible to quantify. I mentioned earlier that one of the ‘extras’ needed in a three-way speaker is a separate internal enclosure for the mid-range driver, and that’s what the Pro 8-3W has. The only problem is that no attempt has been made to seal it from the pressure changes inside the main enclosure. There’s a hole where the mid-range connection cables enter. It just needed a spot of hot melt glue after the cables went through (and yes, I was tempted). Now, I perhaps know what you’re thinking. You’re thinking that it doesn’t matter about sealing the mid-range enclosure because the main enclosure has a big hole (the reflex port), so there’ll be no significant internal pressure changes to worry about. You’d be wrong I’m afraid. In fact, peak internal pressure changes (at port resonant frequency) can be higher in a ported speaker than in an ‘equivalent’ closed-box speaker. So in the Pro 8-3W, the mid-range diaphragm will be driven backwards and forwards at frequencies around the port resonance. Now this won’t result in any significant low-frequency output from the mid-range driver, however it will mean that some of the driver’s available linear movement will be needlessly used-up, and it will mean increased levels of inter-modulation distortion as the port’s resonant frequency is ‘imprinted’ on the output of the mid-range driver. It will also mean the Pro 8-3W’s intended low-frequency performance will be compromised. And it could be fixed with just a drop of hot-melt glue. On discovering the inter-enclosure leak we asked Prodipe to comment. Their response was that the leak was a manufacturing fault, neither intended nor typical, and they supplied a second pair of monitors. The second pair duly arrived, and while the cable access hole between the mid-range and bass enclosures had some hot-melt glue applied, it wasn’t perfect and there was still a small leak — although probably small enough to be of little significance. Sealing the mid-range enclosure is clearly something Prodipe need to tighten-up on. So in its design and manufacture the Pro 8-3W is, unsurprisingly perhaps, fundamentally influenced by the cost savings necessary to produce a three-way speaker at an entry-level price. The proof is in the listening, however, so how did the second pair of Pro 8-3Ws perform? If you’ve read the previous paragraphs you perhaps will be expecting me to recount a less than happy tale here — however, another of the endlessly fascinating aspects of speaker design (yup, that’s right, there are two!) is that sometimes speakers defy the odds and pull off a ‘more than the sum of their parts’ trick. So, despite some rough edges, in particular what I suspect is the aural signature of those unbraced enclosure panels playing along with the music in the 200 to 400 Hz region, the Pro 8-3W does some things quite well. In particular I think it genuinely demonstrates one of the advantages of three-way over two-way; the bass driver can be optimised for reproducing low frequencies rather than be compromised by having to do the mid-range as well. As a result the Pro 8-3W sounds like a big speaker with a wide bandwidth. There’s an authority to the way it reproduces low frequencies, and an ability to effortlessly play loud, that you rarely get with compact, entry-level two-way speakers. Having said that, I was never quite happy with the time domain performance of the low end. I tried with the ports both blocked (with socks, now you’ve asked) and open, but the bass always seemed to have a slightly slurred quality that made any qualitative assessment of low-frequency mix elements more difficult than necessary. Further up the range, the Pro 8-3W lacks the kind of extreme clarity of the best monitors that enables you to feel that you can hear every little detail right down to the noise-floor of a mix, but generally it equips itself competently, with a well-judged overall tonal balance, nicely focussed stereo images and drivers that just get on with the job without drawing attention to themselves. I was left feeling slightly frustrated by the Pro 8-3W. There’s potentially a genuinely good active monitor struggling to make itself heard, but to my mind, as things stand, it is compromised a little too much by the cost savings made to reach the price point. Part of me was sorely tempted to reach for a glue gun, some MDF off-cuts for cabinet bracing and some extra enclosure wadding in order to ‘pimp’ the review pair of Pro 8-3Ws and knock off a few of those rough edges. But of course that’s not what writing a Sound On Sound equipment review is about. What it is about, however, is giving recommendations, or otherwise. As things stand, I’d have to tell you to proceed with caution. If you need a nearfield monitor that plays loud and offers wider LF bandwidth than most more compact monitors at the price, and you can live with the rough edges, then the Pro 8-3W could well have your name on it. 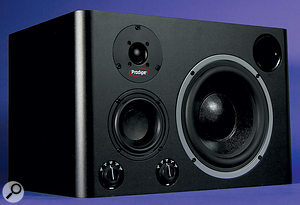 I, however, would be keen to hear a Pro 8-3W MkII... What about it Prodipe? The 8-3W is priced slap bang in the middle of the immensely crowded entry-level active nearfield market, so models from Adam, Dynaudio, Eve Audio, Event, Focal, Genelec, KRK, Mackie, Yamaha and many others are all alternatives on price. There are, however, very few three-way competitors at a roughly similar price, one of which, however, is the Event 2030. Question marks over manufacturing consistency. Cost saving leads to manufacturing and performance compromises. The 8-3W is a brave attempt at three-way for entry-level two-way money. The result is compromised and has some rough edges, but it’s fundamentally a capable monitor. £599.98 per pair including VAT.